This one isn't new — in fact, it happened in 1936 — but I wanted to add it to my archive of such things. 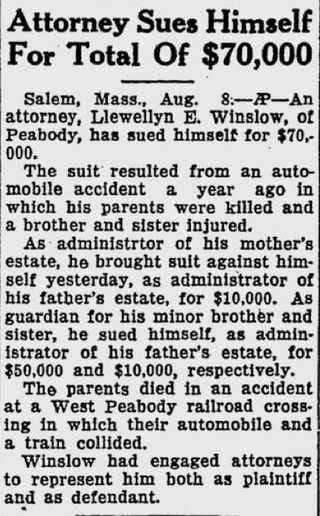 Granted, Winslow was acting in different legal capacities here (at least three of them), and my knowledge of the legal, ethical, and/or probate rules that applied in Massachusetts in the 1930s is a little spotty. But typically, if one feels the need to hire attorneys to represent oneself both as plaintiff and as defendant in the same case, there's something that needs to get untangled. I'm thinking probably someone else should have been appointed as administrator of the father's estate. That last sentence isn't clear as to whether he hired one group of attorneys to represent him in both capacities, or had one of his legal selves retain separate counsel. But it seems like either way, he'd have been adverse to himself in this matter and so all his attorneys would have had to be disqualified because of the conflict of interest. Whether he could then have represented himselves in that situation, I have no idea.